In the darkened main hold of the Millennium Falcon on Ahch-To, a contemplative and saddened Luke Skywalker reflects on past mistakes and the loss of his old friend Han Solo. 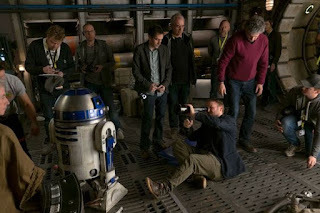 Fortunately, an old Astro Droid buddy will soon raise his spirits yet remind him of his family obligations, in a memorable scene from The Last Jedi. Rian Johnson and team prepare to film the scene.